Tender brined chicken, house-made pickled feta and fresh apple slices create a bright, flavorful salad. A finish of savory streusel crumbles adds crunch. Combine all ingredients except the ice and feta cheese and bring to a boil, stirring to dissolve salt and sugar. Add ice and allow to cool to room temperature and add feta, allow to marinate overnight under refrigeration. Combine all ingredients except the apples and bring to a boil, stirring to dissolve salt and sugar. Allow to cool to room temperature and add apples, allow to marinate for 1 hour or until taste is desired. Combine dry ingredients and herbs in a stand mixer, add butter and beat on low speed until mixture forms a crumble. Spread mixture into a layer on a lined sheet pan and bake at 350°F until brown, toasted, and crunchy. Approx. 25 to 30 minutes. Combine Hellmann’s® Greek Vinaigrette Dressing with salad greens and toss until evenly coated. 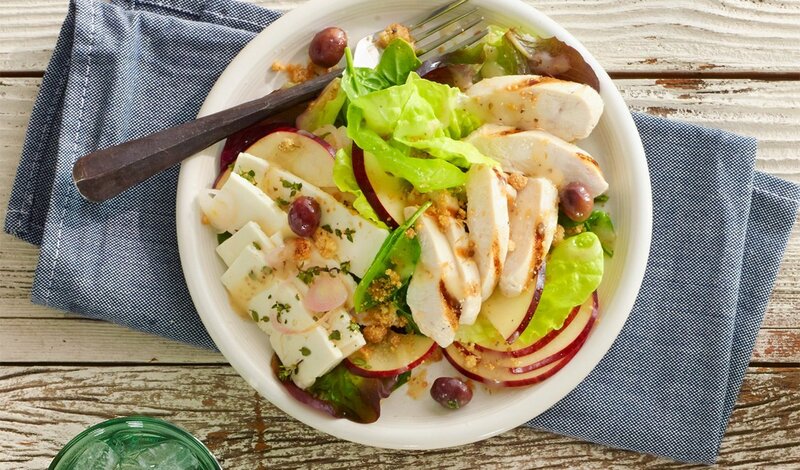 Top salad with Pickled Feta, grilled chicken, olives, Pickled Apple Medley and the Savory Streusel.